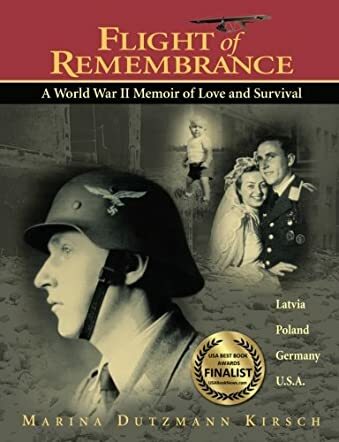 Flight of Remembrance, A World War II Memoir of Love and Survival by Marina Dutzmann Kirsch is the story of two individuals, Rolf Dutzmann and Lilo Wassull, and their extended families. Kirsch's book tells about their childhood, how the two met, fell in love, and eventually got married. Living in Germany during World War II, most of Rolf's and Lilo's story takes place in war time years, and tells of the horrors they lived through both during the war and afterwards, and the war time shortages that were so commonplace (including having no heat, no living wages, and starvation rations). Luckily, eventually the Dutzmanns are able to get American sponsors, and Flight of Remembrance ends with how their family eventually immigrated to the United States. Flight of Remembrance is not only filled with the horrors of Germany during the war, but includes many snapshots and paper memorabilia to really bring the story to life. Everyone thinks of Germans as the "bad guys" but Kirsch's book is a great example of how the truth is always much more complicated; that the Germans were real people, too, and struggled to survive against all odds and with fear for their own lives. Rolf was a well-educated individual, and his struggle to feed and take care of his family is evident on every page, and you can only imagine if his family struggled so much, how much more the average person did - and that is actually the real beauty of Flight of Remembrance, because Rolf is the average person. It's the smallest details that Kirsch shares (such as a favorite childhood book) with readers that make this a memorable read. A great book for anyone who is interested in reading more about Germany, both before and after the war.